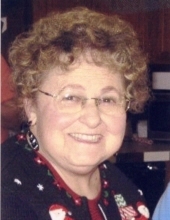 Beverly Jean Moenkhoff, age 79, of Stotts City, Missouri, passed away at 5:27 p.m. on Saturday, December 1, 2018, at the Mt. Vernon Place Care Center in Mt. Vernon, Missouri. She was born January 6, 1939, in Lawrence County, the daughter of Louis and Bertha (Tiesel) Roethemeier. Beverly was a 1957 graduate of Mt. Vernon High School. Beverly and her husband Raymond owned and operated a dairy farm west of Stotts City. She was a very active member of the Zion United Church of Christ, where she served on the church board, was secretary for the cemetery and was an organist for the church for many years. On June 6, 1959, she married Raymond Leroy Moenkhoff in Mt. Vernon, Missouri. He preceded her in death on October 8, 2006. Beverly is survived by her daughter, Deanna McCann and her husband, Kevin, of Mt. Vernon; three sons, Gary Moenkhoff and his wife, Tammy, of Stotts City, Jerry Moenkhoff and his wife, Robin, of Mt. Vernon and Terry Moenkhoff and his wife, Heather, of South Greenfield, Missouri; niece, Jean Claxton of Olathe, Kansas; sister-in-law, Alberta Buhrman, of Stotts City; 12 grandchildren and seven great-grandchildren. Her parents, Louis and Bertha, husband, Raymond, brother, Hoyt Roethemeier and his wife, Carol, and sister, Evelyn Smith and her husband, Ralph, preceded her in death. A funeral service, under the direction of the Fossett-Mosher Funeral Home, in Mt. Vernon, will be held at 2:00 p.m. on Wednesday, December 5, 2018, at the Zion United Church of Christ, southwest of Mt. Vernon. Burial will follow at the Zion Memorial Cemetery. Visitation will be held from 6:00–8:00 p.m. on Tuesday, December 4, 2018, in the funeral home chapel. Memorial donations may be made payable to the Zion United Church of Christ, in care of the funeral home. To plant a tree in memory of Beverly Jean Moenkhoff, please visit our Tribute Store. "Email Address" would like to share the life celebration of Beverly Jean Moenkhoff. Click on the "link" to go to share a favorite memory or leave a condolence message for the family.